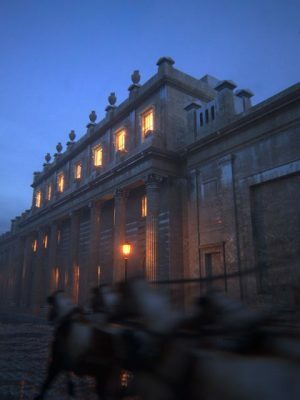 The tour begins with a 3D model of the building, which can be rotated to select a series of individual rooms – a captivating combination of historic parlours and working rooms – and unlock the facts and high-resolution images within. Perhaps the most arresting views will be of a room filled with over 400,000 gold bars, one of the largest stores of gold in the world. Each bar weighs around 13kg, or 2 stone, and is worth around £350,000. Visiting the gold stores will reveal many facts, including the story of a sewer worker who found his way into the vaults through an old drain that he was replacing. In 1836, he wrote to the Bank’s Directors to alert them, before backing up his claim by meeting them in the vaults. His honesty was rewarded with a gift of £800 from the Bank. Elsewhere, the Cash Vault, where the Bank holds some of its stock of banknotes, incorporates a ‘Know Your Banknotes’ feature to guide people through the numerous security features on each of its notes. Among the other highlights is the Bank’s front hall, whose floor mosaics and bronze uplights are decorated with symbols reflecting money. It also contains a mosaic from a 2nd-century Roman villa, uncovered by excavation during the building of the Bank in the 1920s and ‘30s. Elsewhere, the app draws attention to fascinating little details such as the mulberry trees in the Garden Court at the heart of the building, an enduring nod to the earliest days of paper money, which was issued in 10th-century China on the pulp of mulberry trees. The Garden Court was also the resting place of the man known as the ‘Bank Giant’, a former clerk, who was 6 feet 7 ½ inches tall. The Directors had allowed his body to be buried in the Garden Court when he died in 1798, to protect it from body snatchers. The current role of the Bank of England is illustrated by several parts of the tour; it visits the room in which the Monetary Policy Committee meets to set its interest rate. The importance of these meetings is symbolised by the double doors leading to the room – originally installed to prevent eavesdropping. The app also visits the dealing room and the Banking counter. Among the highlights are a Roman mosaic in the Bank’s front hall; the Garden Court, whose mulberry trees are a nod to the earliest days of paper money which was issued in 10th-century China on the pulp of mulberry trees; and, past the Governor’s office and up on the first floor, the beautiful suite of Bank parlours, including the Committee Room, where the official interest rate is set, and the Court Room, which among many beautiful features includes a wind-dial, originally installed so that the Bank’s Directors could forecast the arrival of merchant shipping in the Port of London. The tour will also include an opportunity to visit the Bank of England Museum’s new exhibition Cartoons and Caricatures, which presents the finest examples of two centuries of satirical press coverage of the Bank. Among the key exhibits is the 1797 cartoon which gave the Bank of England its nickname. James Gillray’s cartoon, The Old Lady of Threadneedle Street in Danger, features among many original works showing how the Bank has been portrayed by newspaper and magazine artists since the 18th-century. Destroyed in the 1920s, Soane’s Bank of England is considered one of modern architecture’s greatest losses.